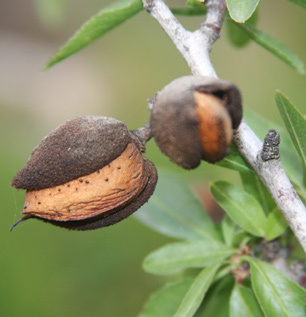 Diazinon is now commonly used on almond crops. Diazinon is an insecticide used to control a wide range of insects, developed in the 1950s as a replacement for DDT. It has been marketed under many trade names, notably Spectracide (a brand that now encompasses many chemicals). Diazinon was one of the most widely used pesticides in the United States for residential applications—almost 10 million pounds yearly—until the EPA restricted and finally banned residential use in 2004. In 2007, several agricultural uses were also banned. It's now used primarily on almonds, stone fruits (peaches, plums, cherries, etc. ), some other fruits and nuts, vegetables, and in cattle ear tags. Diazinon is a persistent pollutant, and can move about relatively easily in the environment. It's toxic to many animals, including birds, fish, and bees, and has been detected in water frequently in both cities and agricultural areas. Diazinon can cause cholinesterase inhibition with acute exposure, overstimulating the nervous system and causing symptoms of nausea, dizziness, confusion and, with exposure to very large amounts, respiratory paralysis and death. It is not believed to be carcinogenic. The EPA recommends hydrolysis for the treatment of diazinon. Sources: EPA, EPA (2), EXTOXNET, Wikipedia, Photo: WikiMedia, author: PikiWiki, "Wild Flowers of Israel"